Palawan is the place you are longing to be -- with its capital Puerto Princesa City, dubbed as the cleanest and greenest in the Philippines, there's in fact, more to this largest province in the country than meets the eye. For foodies, adventure-seekers, water sports fanatics, spelunking enthusiasts, photography and beach lovers alike, Palawan is truly a paradise to fill you with surprise. #1 - Honda Bay: You'll forever remember great swimming and snorkeling in Luli Island, Starfish Island, Pandan Island and Cowrie Island that are some of the islands which comprise Honda Bay, your unforgettable getaway situated in Puerto Princesa, Palawan Island. Starfish or Sea Stars abound in Starfish Island; Luli Island disappears during high tide and reappears at low tide; you can enjoy soothing massages from Cowrie Island; powdery and extremely white sand, on top of the lush forest make Pandan Island amazing too -- you would wish you could be there in a jiffy! #2 - Amanpulo Beach: Amanpulo is heaven on Earth --located northwest of Palawan Island, where tourists arrive via a private airplane. It is your most captivating vacation waiting to happen with its 6.5 -kilometer stretch of fine white sand, glistening torquoise sea, a breathtaking coral reef to explore, food, oh-so-good!, top of the line customer service, perfect rooms with excellent sea views, outstanding windsurfing as well as boating facilities... Amanpulo Beach Resort is definitely a priceless experience, where your presence makes the most sense! #3 - Nagtabon Beach: About 45 minutes from Puerto Princesa City, Nagtabon Beach is an extremely serene spot in Palawan, which although still undeveloped, promises to be one of your best day trips ever. Get mesmerized by its white sand, crystal clear water, romantic sunset, helpful locals and water activities (skim boarding, surfing, snorkeling, spearfishing, along with island hopping) -- just get ready with your own food in addition to your drinks plus other supplies such as, tent, garbage bags, etc., to guarantee an awesome day over at pristine Nagtabon Beach. #4 - Dimakya Island: This island exclusively hosts the amazing Club Paradise Resort. Warm and friendly staff, sumptuous meals, superb massages, huge rooms, awesome bathrooms, comfortable beds, sparkling clean ocean water, powdery white sand, marvelous diving as well as snorkeling experience, and so on -- all make the fantastic set up for you and your loved ones in Club Paradise. True to its name, this commendable heavenly place in Palawan can be found in Dimakya Island, Palawan Island. Rest assured, you can leave all your worries behind, and in Club Paradise, stop to unwind. 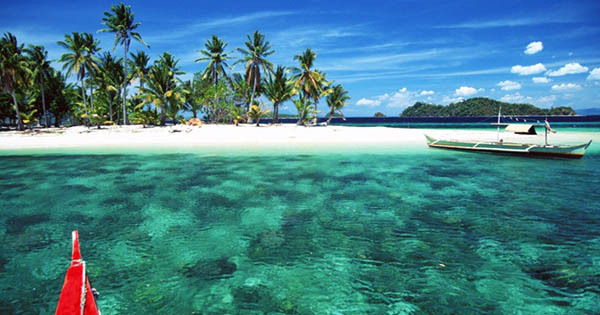 #5 - Bulalacao Island: This is the infamous island where Two Seasons Coron Island Resort & Spa is exclusively located. Aside from its ultra tidy rooms and surroundings, you will also be amazed at their very hospitable staff, soothing massages, and other fabulous amenities that include comfy beds, TV, a restaurant, bar, library, shop, swimming pool, gym, aqua sports building, etc.